Anne of Green Gables once said, “I’m so glad we live in a world where there are Octobers”. I’m in total agreement with Anne on this one and completely LOVE October. This weekend we hosted our annual McGurn bonfire and it was a hit. We had over 50 friends over for a night of delicious apple crisp and salted caramel hot cocoa. Babies were snuggled, football was played, and everyone enjoyed the fellowship of a perfect fall night. When times are good like this, it’s so easy to think about all of the wonderful things we have to be thankful for. In the spirit of fall and Thanksgiving I decided to make a “thankfulness tree” to help us remember all of the things we have to thank God for. 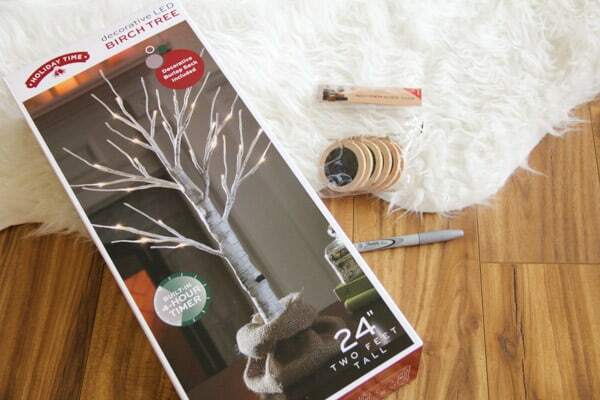 I picked up this 24″ LED birch tree for $20 at Wal-Mart from the Christmas section. Speaking of Christmas can you believe Halloween hasn’t even passed and the full stock of Christmas is already out?! Anyways, if you can’t bare to walk the Christmas aisles this soon, or you can’t find it, I found it on Amazon as well for not too much more *contains affiliate link*. 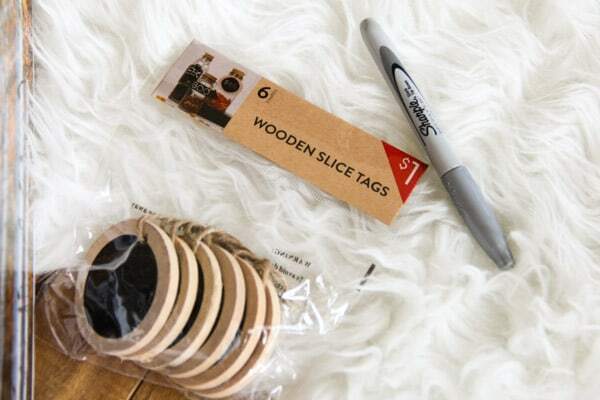 Then I picked up four packs of these adorable wooden tags from Target in the dollar section. As adorable as they are I’m sure they will be gone quickly, so I also found some cute ones on Amazon. With those links now you can complete this project without ever leaving your home. Unless of course you don’t own a silver sharpie… I’ll save you the trouble of searching for one and you can add one to your Amazon order here as well. 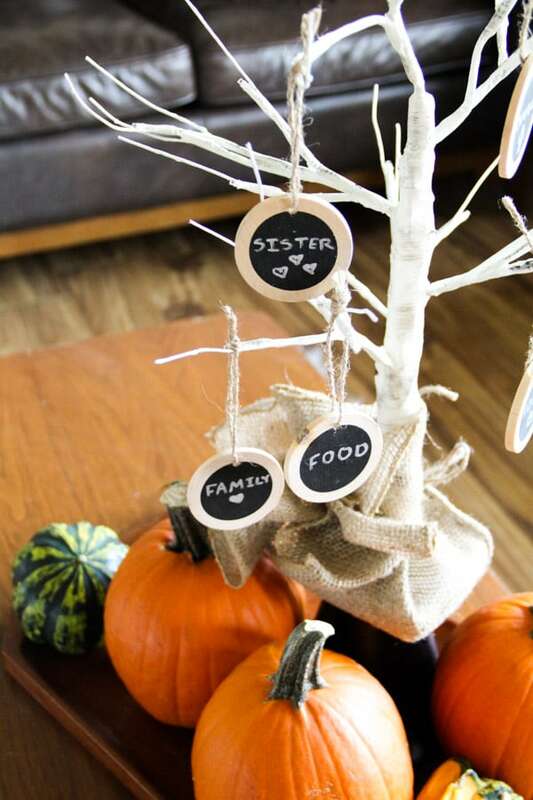 So once I had the three simple components for my thankfulness tree, assembly was as simple as brainstorming a few things we’re thankful for, and hanging them on the tree. We started with six, but I’ve got 18 more tags so that we can fill this tree up. My plan is to do one at dinnertime each night. Hopefully by filling the tree full throughout the coming days until Thanksgiving, it will be a constant reminder of God’s goodness to us. When the whining and complaining starts to set in, it will also be a visual reminder of everything that we have to be grateful for. Maybe eventually we’ll even have to add another tree! We could start a thankfulness forest! 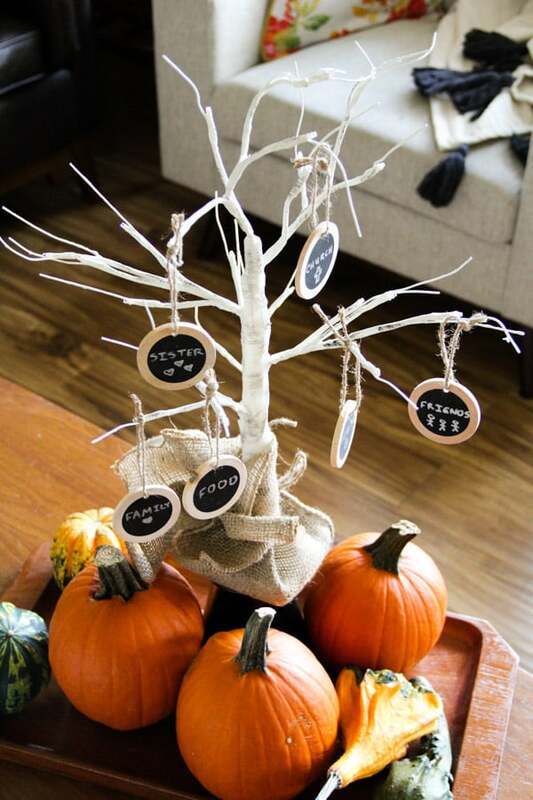 I mentioned in my Halloween decor post that I like to keep my fall decor pretty simple. 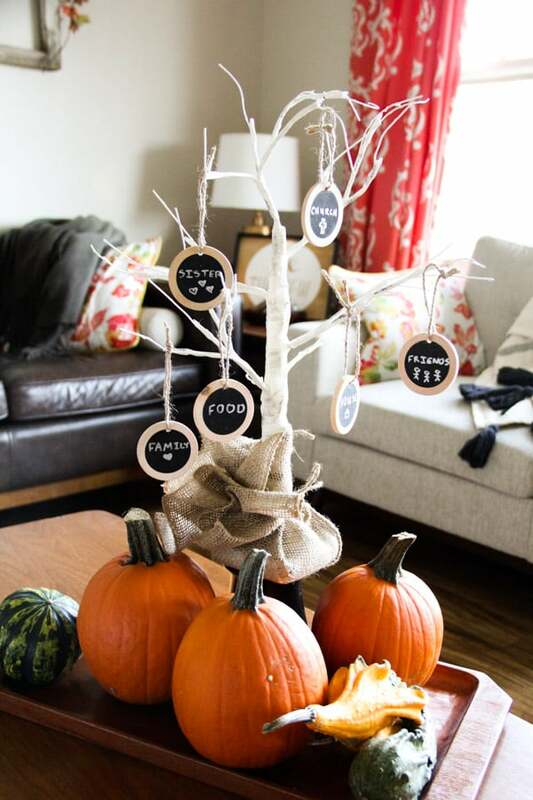 Adding a few $.59 cent gourds and pie pumpkins made for the perfect fall vignette around the tree. The tree also folds up making it really simple to store for next year. I could actually see leaving it out through Christmas… it is supposed to be a Christmas decoration after all! 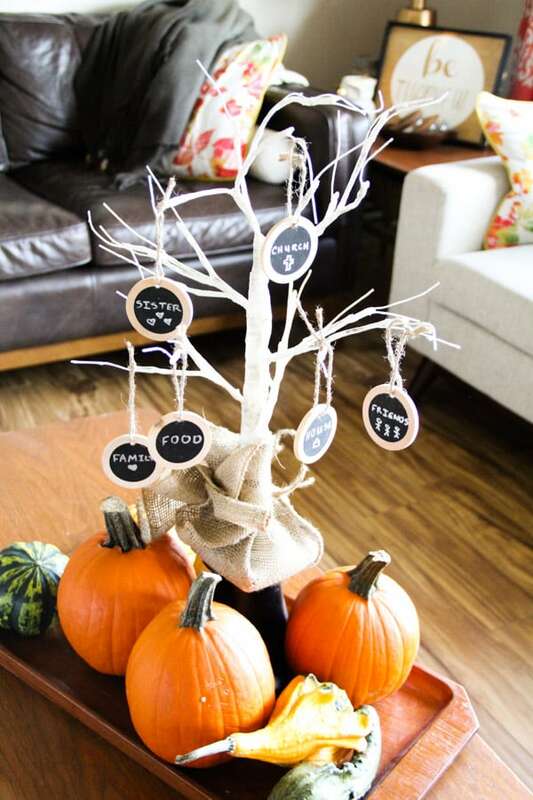 Whether or not you create a thankfulness tree, I want to challenge you to spend time with your family considering all of the things you have to be thankful for. We live in an oil boom town, and if you haven’t heard oil prices are currently incredibly low. This means that many people are out of work and many friends have had to leave town for other work. Home prices are dropping, layoffs are increasing, and its pretty depressing. The current state of things around our town is a sort of doom-and gloom mentality. Sometimes it’s nice to take a step back and look at the bigger picture and remember that God is holding us in his hands. This exercise in thankfulness is just one simple way to recognize that. Later this week I’ll back with my entire “fall home tour”, but here’s a quick step back at a glimpse of more of our fall decor. 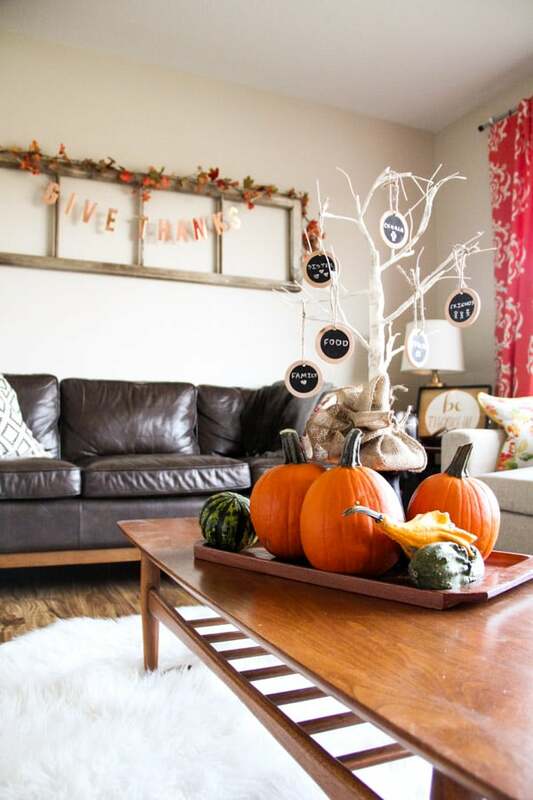 I already shared our fall dining room, but if you missed it you can check it out here! Also, if you’re loving everything fall as much as I am you might love my fall recipes for pumpkin cheesecake dip and salted caramel hot chocolate! 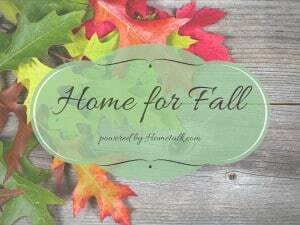 Thank you so much to the ladies at home talk for hosting this great Home for Fall Blog Hop! 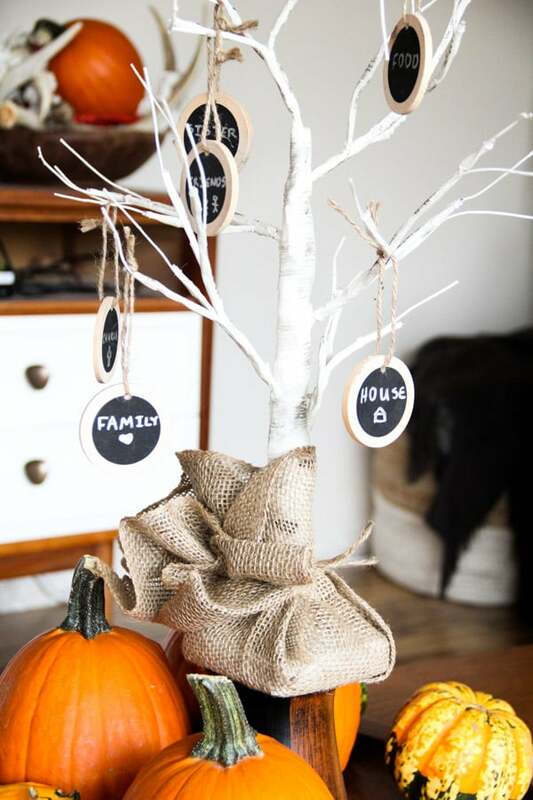 If you want to check out tons of other great fall DIY’s click through this link up! 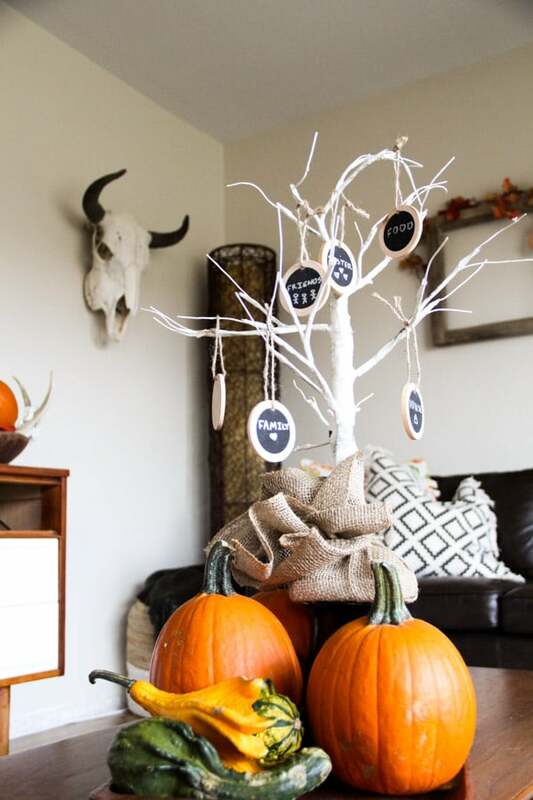 So have you decorated for fall?! Do you have any great thankfulness traditions?! I love how easy this looks! I could totally whip this little tree up! So glad to “meet you” through the Home for Fall blog hop! Pinning for reference! Thank you so much! Nice to meet you too! I’m just finally getting to check in on all of the blogs from the hop!